20 Indian nationals were on boats struck by coalition airstrikes off the coast of Yemen. Two boats carrying 20 Indian crew members were were bombed by warplanes on Tuesday evening in Yemen. The warplanes belonged to a Saudi Arabia-led coalition that has been striking Houthi rebel positions in Yemen since earlier this year. 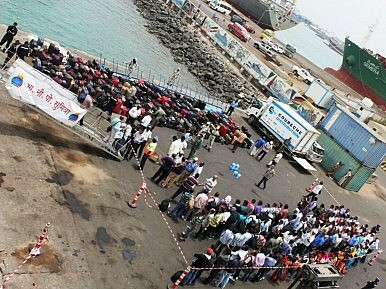 Late on Tuesday, eyewitness and reports from Hodeidah, Yemen suggested that 20 Indian crew members had all perished. On Wednesday, a day after the strikes, India’s foreign ministry confirmed that 13 Indian crew members were confirmed to be alive and seven remained missing. Regarding the circumstances of the bombing, Swarp noted that the Indian ministry noted that “we have ascertained that there were two boats one of which was plying between Berbera (Somalia) and Mokha (Yemen).” India does not currently have an embassy in Yemen and reportedly verified the status of the boats from its embassy in Djibouti. The Indian government did not confirm the source of the strikes or what the Indians were doing near Hodeidah. An earlier Reuters report noted that the struck boats contained “fuel smugglers.” According to the BBC, Houthi officials have denied that the boats contained fuel smugglers, saying that the crew were fishermen. Earlier this year, India played a major role in helping evacuate foreign nationals from Yemen after the Saudi-led coalition began strikes against Houthi positions. India evacuated nearly 500 of its own nationals from Yemen under Operation Rahaat, which led to requests for Indian assistance by a range of countries unable to evacuate their own citizens from Yemen. To buttress its evacuation operations, New Delhi dispatched a range of military and civilian assets to Yemen, including one missile destroyer and two frigates. India also sent two transport ships, three chartered flights, and two Indian Air Force C-17 Globemasters. Why Would Pakistan Send Combat Troops to Saudi Arabia Now? Pakistan's consideration of a combat troop deployment to Saudi Arabia would cross an important line. In India’s Elections, Voters Will Choose Between Guns and ButterIndia’s National Security Election: Why It’s Advantage ModiIndia, Sri Lanka Conclude Agreement on Countering Drug and Human TraffickingIndia’s Ruling BJP Releases Manifesto: Document Emphasizes Continuity in Foreign PolicyWhat Does India’s Strategic Community Perceive As the Country’s Largest Challenge?